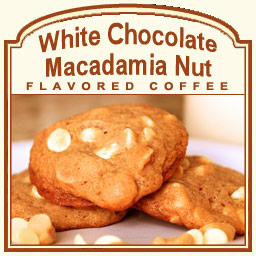 The White Chocolate Macadamia Nut flavored coffee is made with 100% Arabica beans and a full-body of buttery and fresh macadamia nut flavor. Wholesome and filling, this White Chocolate Macadamia Nut coffee features an aroma that will calm your senses and appeal to your taste buds. With only 2 calories per cup, this White Chocolate Macadamia Nut coffee features a sweet white chocolate flavoring along with its body of nutty goodness. Perfect for anyone that loves macadamia nuts and chocolate, this mix of flavors will hit the spot. FlavoredCoffee.com is now offering 1/2lb bags of our flavored coffees, so you can sample multiple flavors to discover your favorites! A heat-sealed valve bag will ensure the freshest coffee possible, which is why the White Chocolate Macadamia Nut flavored coffee will be roasted and shipped on the same day. Full in flavor and decadence, this dreamy White Chocolate Macadamia Nut flavor will have your taste buds exuding luxury and sweetness. Mmm � delicious!